MONTREAL -- Third-seeded Novak Djokovic defeated Nicolas Kiefer 6-3, 6-3 on Tuesday to advance to the third round of the Rogers Cup. "At the start of the match, I didn't put a lot of first serves in and he tried to go to the net right away, be aggressive," Djokovic said. "That was his style, but I managed to hold, stay focused and get it over in straight sets." 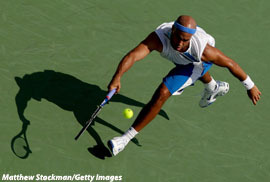 James Blake held off Jurgen Melzer 7-5, 7-6 (4) in a match that featured only one service break. Blake did not have to defend a single break point in the match, while Melzer fended off 13 of Blake's 14 break points. He will face Lleyton Hewitt in the second round. "I haven't seen too many matches where you look through and you see a sure win for anyone," Blake said. "It's a great testament to the depth of men's tennis, how good these guys really are." Andy Murray, playing his first tournament since a right wrist injury sidelined him in May, defeated Robby Ginepri 6-4, 6-4. Marat Safin advanced when Robin Soderling retired leading 2-1 in the first set. He will face second-seeded Spaniard Rafael Nadal for the first time in his career in the second round. "What do I have to lose?" Safin said. "I'm not going to tank the match, I'm going to try to win it, of course. But I'm definitely not expecting anything great out of it." Sixth-seeded Fernando Gonzalez of Chile was upset by Radek Stepanek of the Czech Republic 6-7 (2), 7-6 (1), 6-4. Tommy Haas advanced with a 6-3, 7-6 (6) win over Agustin Calleri. Haas had 11 of the 24 aces in the match. Jarkko Nieminen won 6-3, 6-4 over Julien Benneteau, and Ivo Karlovic eliminated Max Mirnyi of Belarus 4-6, 6-3, 7-6 (3). There was only one Canadian player left in the singles draw after Frederic Niemeyer lost 6-4, 6-2 to Mario Ancic in the final match of the night.